Hi, Good morning. Thank you, friends and viewers. Today I will post how to make coconut burfi recipe. This is one of my aunt's signature dish. I am very fond of her coconut burfi. Her dish would be in pure milk white in colour. I also tried to make but lost the actual colour. I always wondered how she could get and fascinate to that whitish burfi. During my childhood days Whenever I visit her, I get a chance to have this dish specially made for me. Very simple and easy dish to make. We need as less as only two ingredients to make it, sugar and grated coconut. It is always advised to use fresh coconut instead of store bought desiccated coconut. We can make a lot of alterations to it like adding milk, adding khoya or even we can add milkmaid to get the rich taste. I always prefer to make it in an original way only. Of course, mine was not whitish in colour. Donno the reason, but anyone tries this and get whitish burfi, please let me know the trick. Pack one or two pieces in kids snack box, they will get all the good qualities of coconut and instant energy with the sweet. Coconut Burfi -- coconut sweet cooked along with sugar. Grate coconut using grater. Follow the instructions from the blog to know how to grate it. Grate the coconut to half or little more than half of it only. If we grate it till the end we would get slight brownish colour. We can grind it also, but it is a big challenge, as we have to peel the hard sking of the flesh and then chop them and grind it. OKAY!! grind it or grate it, but keep desiccated coconut ready for making this dish. In a thick bottomed kadai or pan, add the coconut and saute for a while or till the aroma arises. Add sugar and mix it well. And keep stirring it till sugar melts and it should become a single mass. 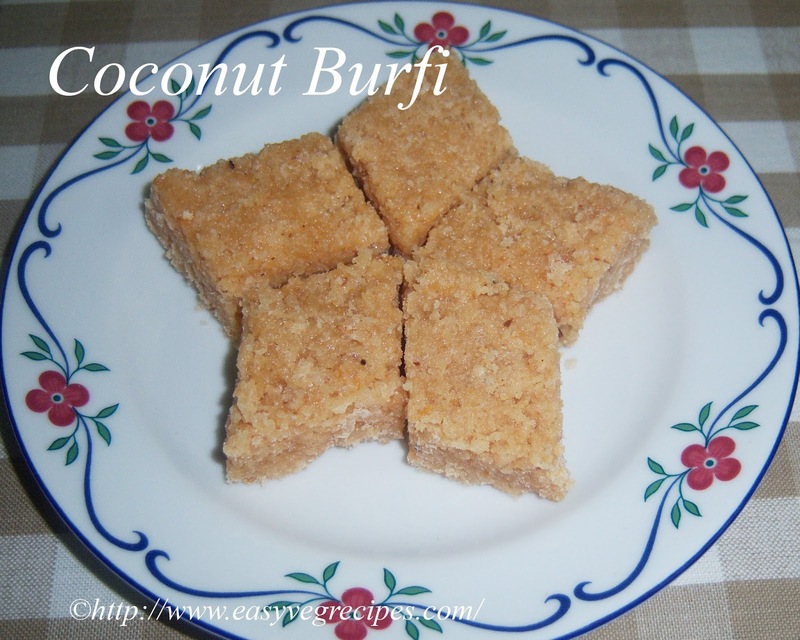 The burfi should not stick to the pan and all the moisture in it should dried off. Add cardamom powder and mix it well. Once it is done, spread this on the grease plate, allow this to cool for some time. 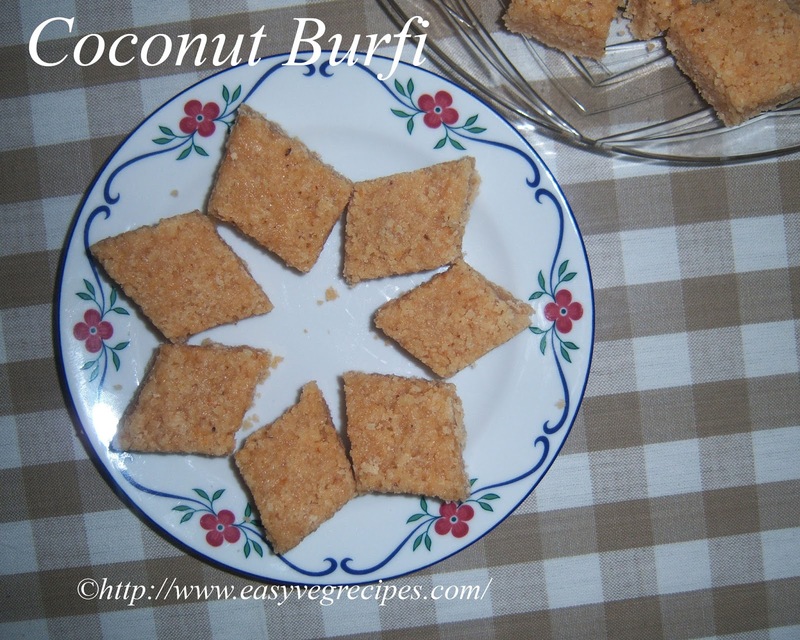 Serve cooled coconut burfi anytime.